Previously on Getting Started with the MaKey MaKey we discussed how to make your standard banana space bar. But what if you want to make a full-on banana piano, and the default MaKey MaKey key presses don't fit your needs? Among its many magical characteristics, the MaKey MaKey is easily reprogrammable, so you can customize the key-mapping to fit your project. In this tutorial we'll show you how to use Arduino -- the most popular embedded development environment out there -- to reprogram the MaKey MaKey and modify which inputs press which keyboard or mouse control. We'll also talk a bit about that mysterious output header, which you can use to turn the MaKey MaKey into more than just an input device. Please Note: This tutorial only applies to Makey Makeys purchased from SparkFun or a SparkFun Distributor that have the SparkFun logo printed on the board. Variants of the Makey Makey purchased from other sources may not work with the instructions laid out in this guide. Before following along with this tutorial, we highly recommend you read through our Getting Started with the MaKey MaKey tutorial. That guide will help get you fully up-and-running with the MaKey MaKey, leading you from driver installation to making your first key. What is an Arduino? -- An overview of Arduino, from the IDE to the boards to the language. How to Install the Arduino IDE -- You won't get too far in this tutorial without having Arduino installed, this tutorial will help you through the process. Logic Levels -- Learn about the difference between HIGH, LOW, 0V, 5V, on, off, etc. Using GitHub -- The MaKey MaKey Arduino files are hosted on GitHub, where we keep the most up-to-date files. Before you can program the MaKey MaKey using Arduino, you need to download and install the Arduino IDE (integrated development environment). Check out our Installing Arduino IDE tutorial for help with that. From there you can access the Arduino application by double-clicking (using the MaKey MaKey!?) the Arduino application. The MaKey MaKey addon for Arduino adds an entry to the Arduino "Boards" list tailored to the MaKey MaKey. 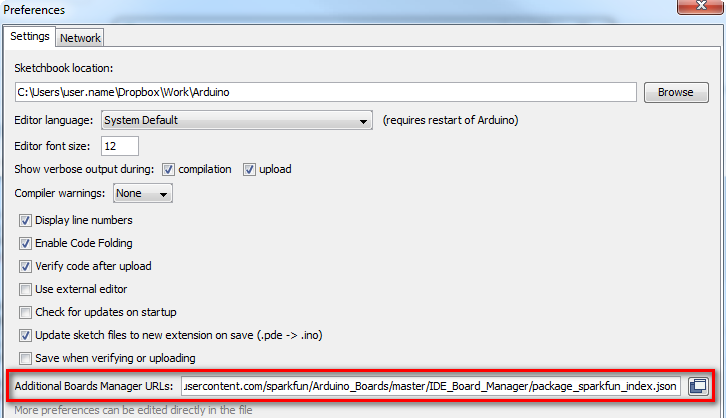 Arduino 1.6.4 introduced the Board Manager feature, which makes installing board addons as easy as a few button-clicks. Arduino 1.6.4 or later requried. Stuck using an older version? Click here. Note: These Arduino addon files only work with Arduino 1.5 and up. If you're using an earlier version of Arduino, either update (and get some cool new features), or download the older version of the Addon. The download is a zip file, which includes a directory named “hardware”. Unzip the hardware folder into your Arduino sketchbook. Where’s your Arduino sketchbook? Well, by default, it should be an “Arduino” folder in your home directory, but to double-check you can go to File > Preferences within Arduino and see the Sketchbook location text box. Just make sure you close all Arduino windows once you’re done. Make sure any existing Arduino windows are closed (if you’ve opened any), and open up a new Arduino window. Let’s do some programming! Then hit "OK", and travel back to the Board Manager menu. 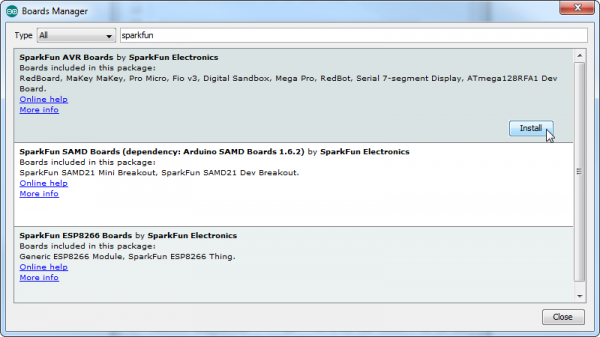 You should (but probably won't) be able to find a new entry for SparkFun AVR Boards. If you don't see it, close the board manager and open it again. ¯\_(ツ)_/¯. Select Install, and wait a couple seconds while the addon downloads and installs. You're just about ready to modify the firmware driving the MaKey MaKey. But first there are a few settings we need to adjust. The addon you installed will add a "MaKey MaKey" option to the Tools > Board menu within the Arduino IDE. Go ahead and select that. You'll also need to set the Serial Port. When you plug in the MaKey MaKey it enumerates as a communication device and gets assigned a COM port (Windows users, you'll need drivers installed, see here). 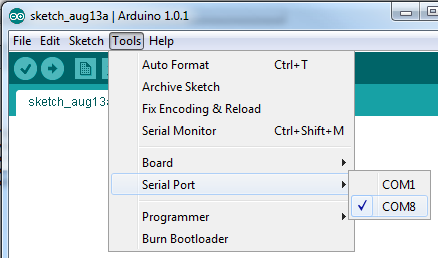 Select the MaKey MaKey's COM port under the Tools > Serial Port menu in Arduino. For most users, there'll be only one port to choose from. If there are two, unplug and replug the MaKey MaKey in, observing which COM port disappears and reappears. Onto the code. You can find the most up-to-date MaKey MaKey source code at its Github home (check out our Using GitHub tutorial for help downloading). Or click the link below to download it directly. It's another ZIP file, so don't forget to extract it! 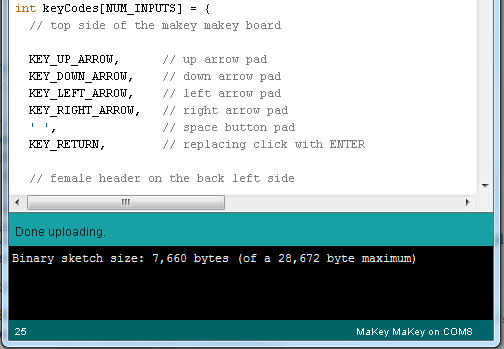 There are two pieces to the MaKey MaKey code: the main file (currently makey_makey_1_4_2.ino) and the settings.h file. Open the .ino file with your Arduino IDE, settings.h will open up in a tab up top. // larger value makes it easier to "release" keys, but harder to "press"
// smaller value makes it easier to "press" keys, but harder to "release"
If you want to define an input as a-z, A-Z, 0-9, or other printable characters, you can fill the keyCodes array with single characters surrounded by apostrophes (e.g. 'a','s','d',...). If there's no printable character for the key you need, like the arrow keys, modifier keys, etc. you'll need to use one of the defined special key values. The special keys available are all printed (in comments) at the bottom of settings.h (KEY_LEFT_CTRL, KEY_LEFT_SHIFT, etc.). Their function should be pretty self-explanatory. Just remember, there can only be 18 total values, comma-seperated, in that array! As an example, say you want the 'CLICK' key on the top side to instead be the ENTER key. Easy! Just go to the sixth entry (position 5, darn that 0!) in the keyCodes array and replace MOUSE_LEFT with KEY_RETURN (just like that, all caps, don't remove the comma that was there already). Now you should have some ENTER action on your MaKey MaKey, in place of the top-side click! If an elephant remains in this room, it's probably that output/expansion header at the top of the board. 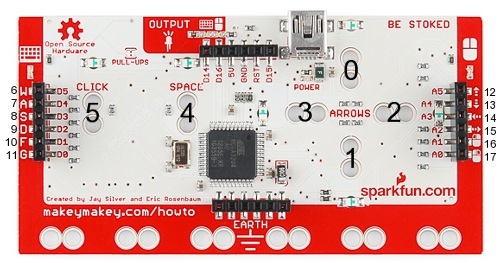 This header is what really makes the MaKey MaKey versatile. Not only can the MaKey MaKey receive inputs from all sorts of crazy objects, but output signals back into the world. D14 and D16 are what we're going to focus on here. The default MaKey MaKey firmware configures each of those pins as outputs. They'll produce either 5V or 0V, on depending what MaKey MaKey keys are pressed. D14 is tied to the keyboard inputs, so whenever a keyboard button is pressed, it'll generate a HIGH (5V) voltage, otherwise it stays LOW (0V). Same goes for D16, which is tied to mouse buttons/movements. What use is that? Well it's a great way to trigger external objects. You could hook up an LED to those pins, and get even more blinkies! Or, you could connect a DC motor, to automate something. Or you hook it up to a 5V relay, and really get your MaKey MaKey interacting with the world. Anything that can operate on a 5V DC signal could be triggered by one of these inputs. Arduino Learning Database -- A series of code examples which will help you figure out exactly what's going on with all this Arduino code. Don't be afraid to try loading the MaKey MaKey with Arduino sketches that have little to do with MaKey MaKey-ing. A great way to learn how to code is by following code examples, of which Arduino has many. 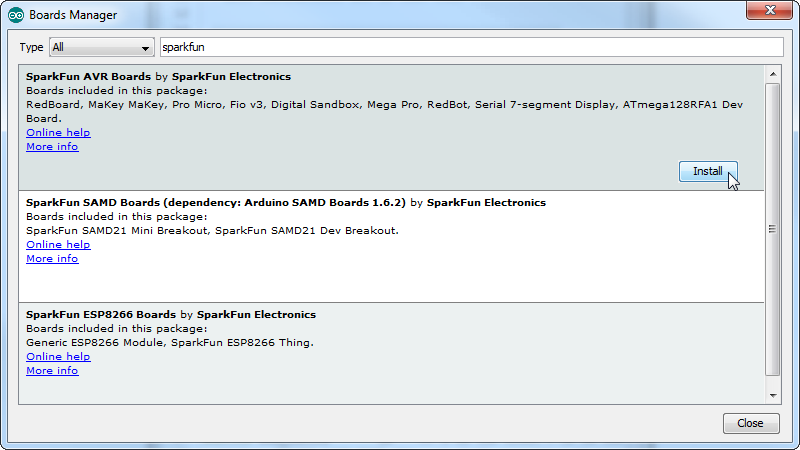 Either peer into the File > Examples menu within Arduino, or check out all of the links on this database. Arduino Language Reference -- Here you'll find links explaining the purpose and operation of Arduino's standard structures, variables, and functions. This is a great place to look up what exactly digitalWrite(), int, loop(), and the rest are all for. Arduino Community Forum -- Anything left unanswered after browsing the previous two links? Head over to the community forum! Try searching out for previously asked questions, or pose one of your own. Turn Your Arduino Into A Keyboard/Mouse -- How to take advantage of the Keyboard and Mouse functions of the ATmega32U4. 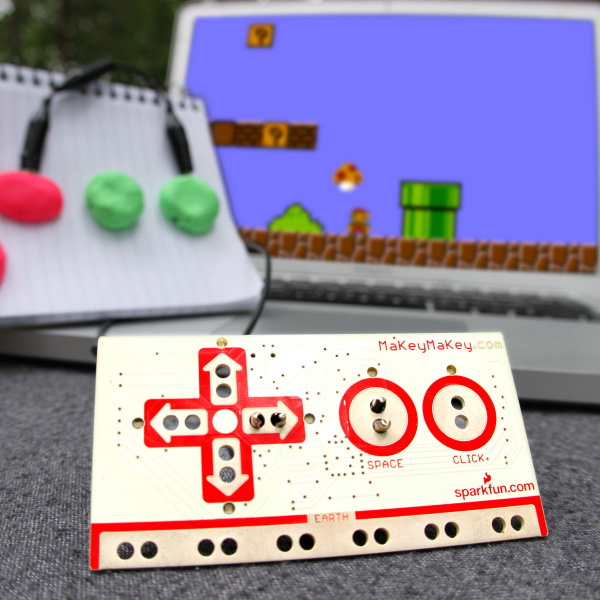 The MaKey MaKey makes use of many of the functions discussed here. If you're curious about writing your own version of the MaKey MaKey code, this might be a handy place to start. Arduino's also got an entry for the Mouse and Keyboard library on their website. Arduino Comparison Guide -- Learn about other Arduino-compatible boards like the Uno and Leonardo.